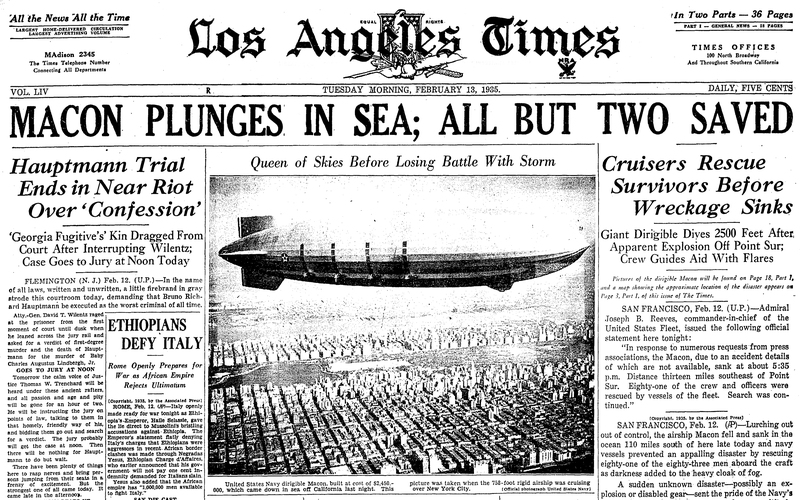 Eighty years ago, the U.S. Navy's last great airship crashed into the Pacific Ocean and disappeared. 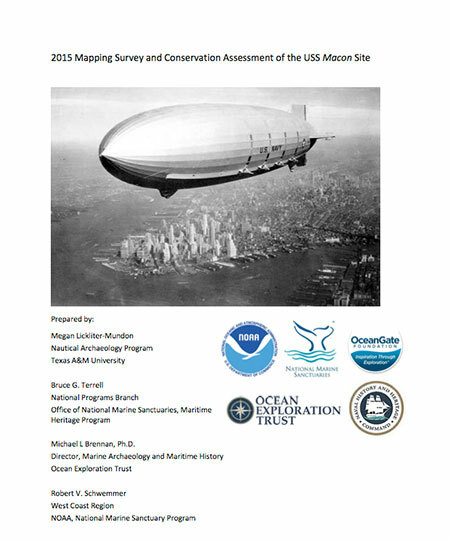 The USS Macon's location was lost until researchers discovered its remains 1,500 feet below the surface of Monterey Bay National Marine Sanctuary in 1990. 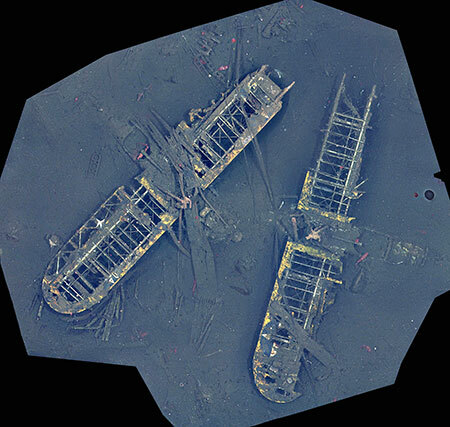 The first archaeological survey of the wreck site took place in 2006, and this year, on August 18, NOAA's Office of National Marine Sanctuaries is working with the U.S. Naval History & Heritage Command and Ocean Exploration Trust in collaboration with OceanGate Foundation to archaeologically survey the wreck site of this "flying aircraft carrier" and its four Curtiss Sparrowhawk biplanes. 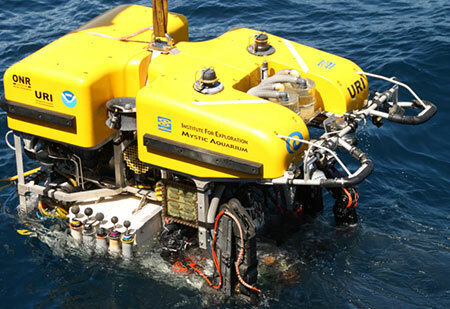 The survey will be conducted from the E/V Nautilus, and will be livestreamed on the Nautilus Live website. 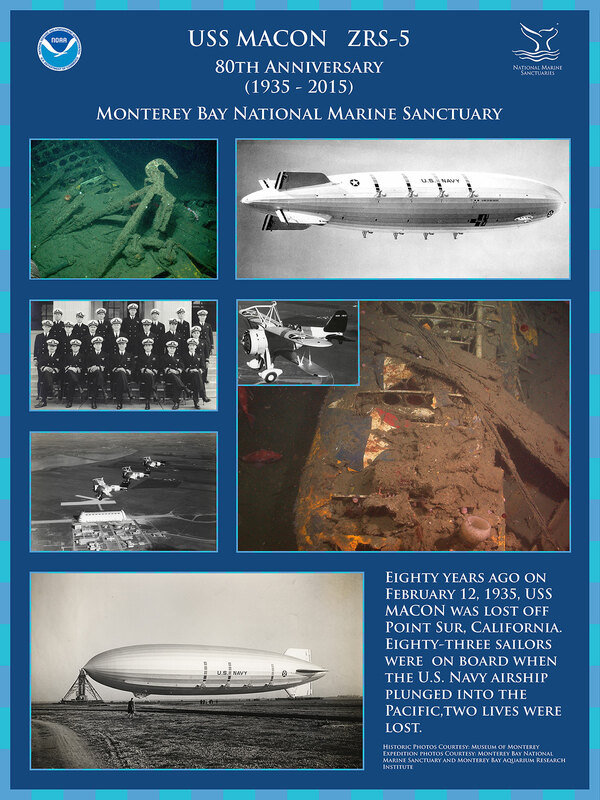 In 2015, Monterey Bay National Marine Sanctuary commemorated the 80th anniversary of the loss of the USS Macon ZRS-5 and its four Sparrowhawk F9C-2 biplanes, and the death of two U.S. Navy sailors on February 12, 1935. USS Macon ZRS-5 inflight. 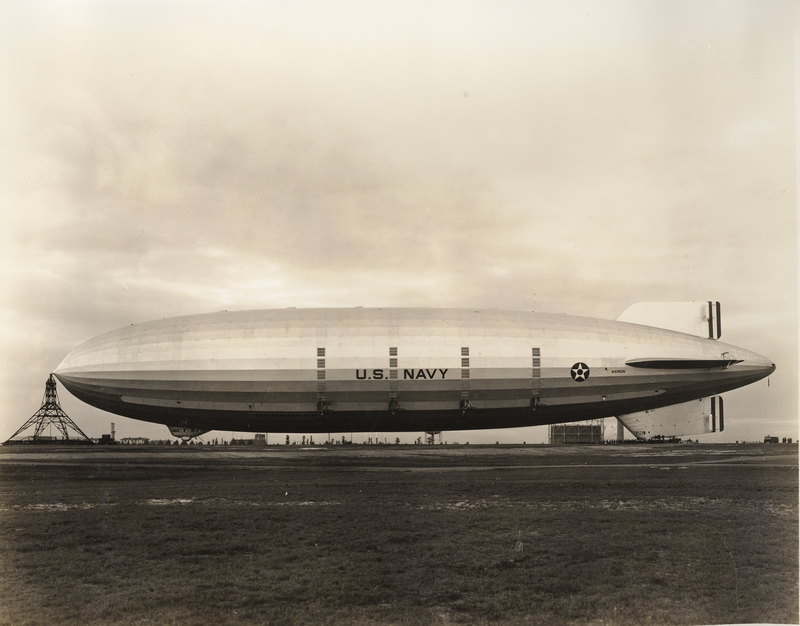 The airship was 785 feet in length and was referred to as a "flying aircraft carrier." 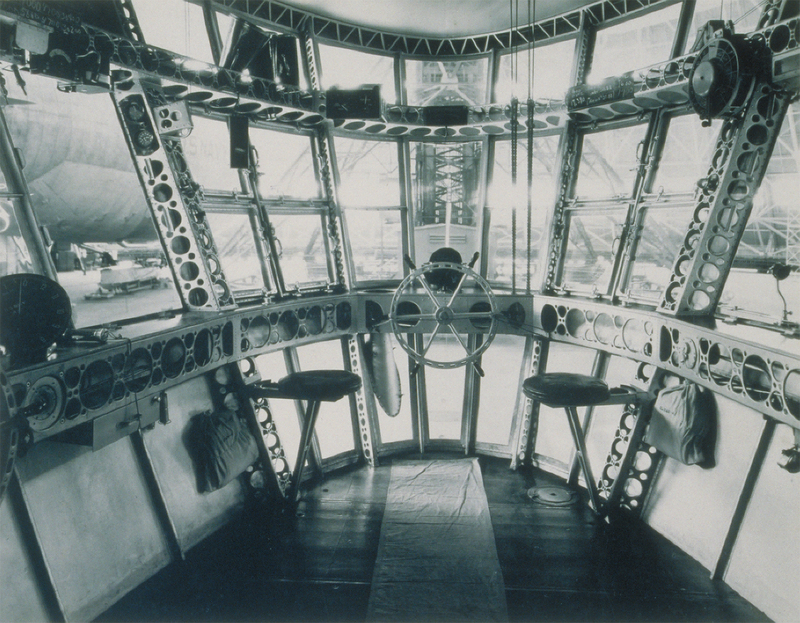 Underneath the airship is an aircraft secured in the hangar bay opening just aft of the control car. 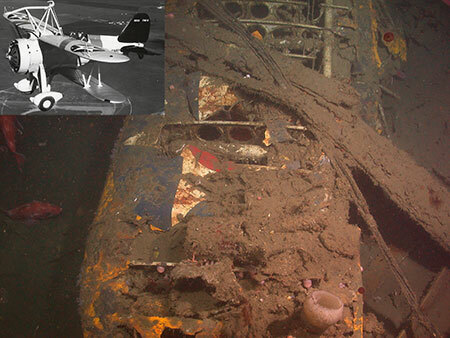 Submerged view of he port wing of one of the four Curtiss Sparrowhawk F9C-2 biplanes recorded at the USS Macon site in 2006. 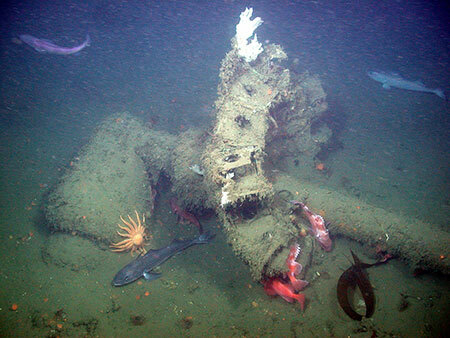 The U.S. Navy star is still visible 71 years after the loss of the airship and four biplanes. 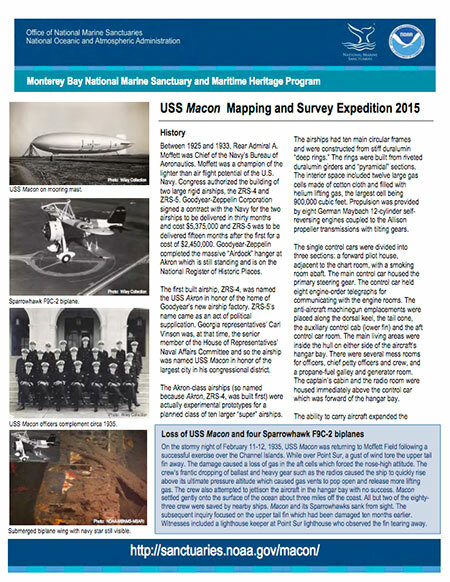 U.S Navy officers serving on board the USS Macon ZRS-5. 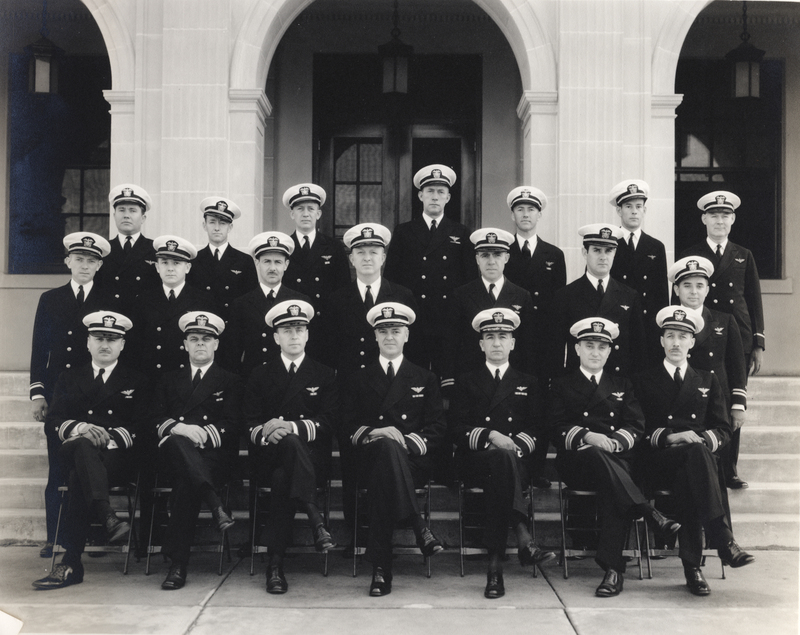 Photograph taken in Monterey, California circa 1935. Lieutenant Commander Herbert Wiley is seated in the front row center. 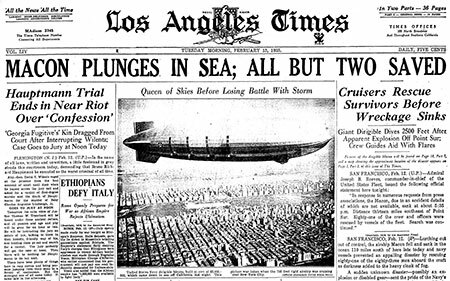 Los Angeles Times February 13, 1935 front page reporting the loss of the USS Macon ZRS-5. 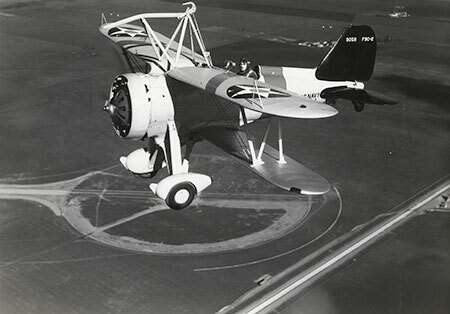 USS Macon’s propulsion system included eight German-built Maybach 12-cylinder gasoline engines with Allison out-drives with attached propellers. 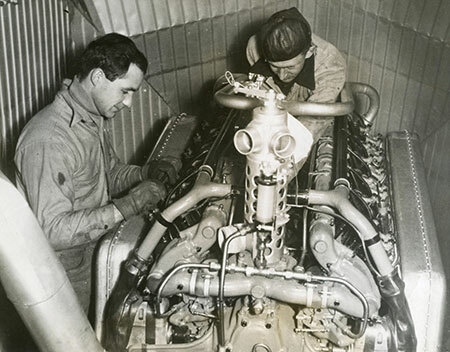 The engines were mounted internally, each with its own engine room. The control car held eight engine-order telegraphs for communicating with the engine rooms. USS Macon’s ZRS-5 control car interior looking forward. 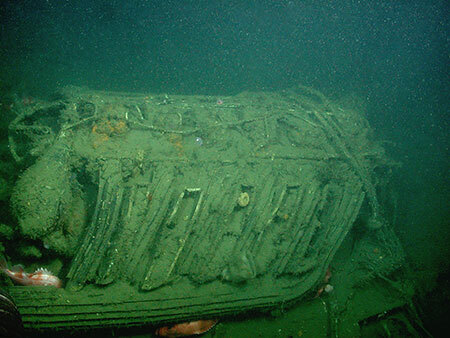 Submerged view of one of eight German-built Maybach 12-cylinder gasoline engines located on the seafloor. The spark plug wires are still clearly visible, assisting the science team in verifying the number of cylinders. 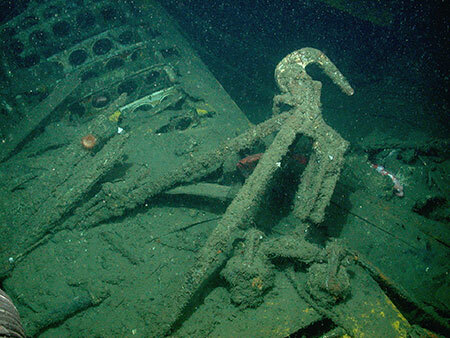 Submerged view of the “skyhook” located at the center of one of the Curtiss Sparrowhawk F9C-2 biplanes. 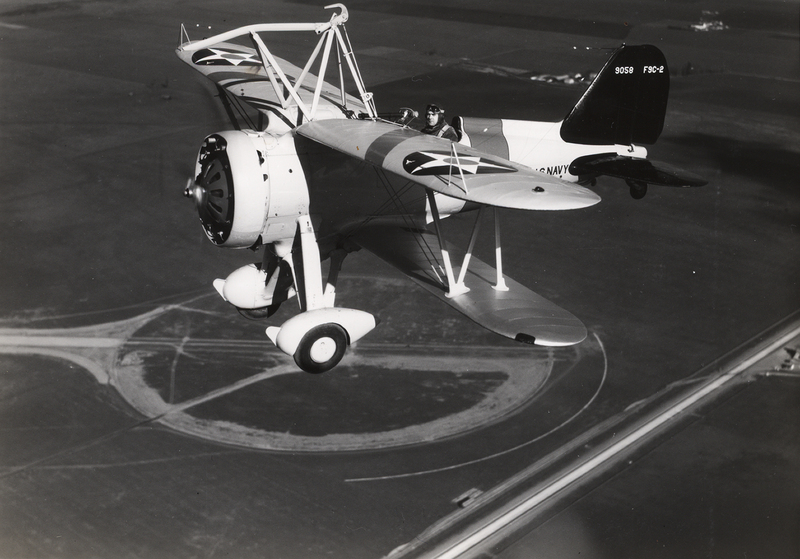 Curtiss Sparrowhawk F9C-2 biplane. The aircraft’s “skyhook” had a guide bar that assisted the pilot in capturing the trapeze lowered from the USS Macon’s hangar bay. The Squadron exhibited its own designated color on top of the wing chevron, engine cowl and wheel spats. Sparrowhawk BuAer No. 9058 exhibited true blue. Photomosaic of two Sparrowhawks F9C-2 biplanes recorded on the seafloor at the USS Macon wreck site during the Monterey Bay National Marine Sanctuary and Monterey Bay Aquarium Research Institute archaeological expedition in 2006.
Credit: MBARI-NOAA/MBNMS-Ken Israel Integral Consulting Inc.
Curtiss Sparrowhawk F9C-2 biplanes flying over Hangar One at Moffett Airfield in Sunnyvale, California. 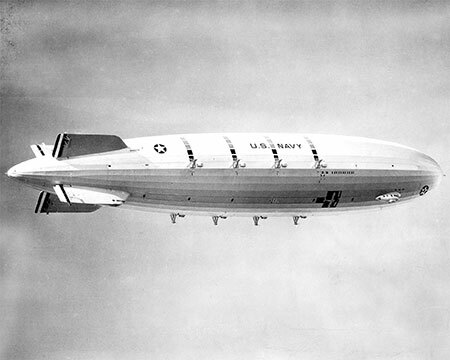 At the time of the loss of the USS Macon, four of the five Sparrowhawks assigned to the airship were lost. 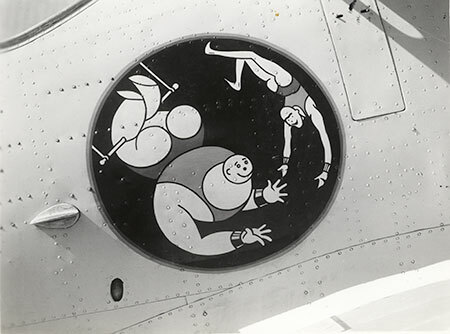 Lieutenant Commander Herbert Wiley is credited for designing the emblem painted on the Sparrowhawk’s fuselage depicting the “men in the flying trapeze.” The larger person represents the airship, while the smaller person represents the Sparrowhawk. USS Macon ZRS-5 attached to its mooring mast. 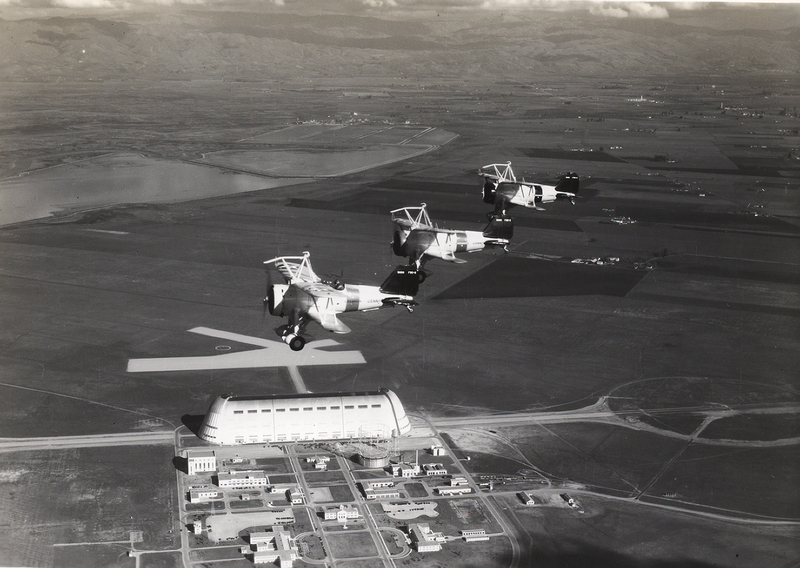 The airship’s stern section was attached to a rail system on the airfield so the ship could weathervane, or move with the wind direction. Submerged view of the USS Macon’s mooring mast receptacle assembly, the most forward part of the airship and possibly the last section of the ship to sink. The tapered cone would mate up with the land-based mooring mast. Argus is a stainless steel towsled-style ROV that will be used in conjunction with ROV Hercules. 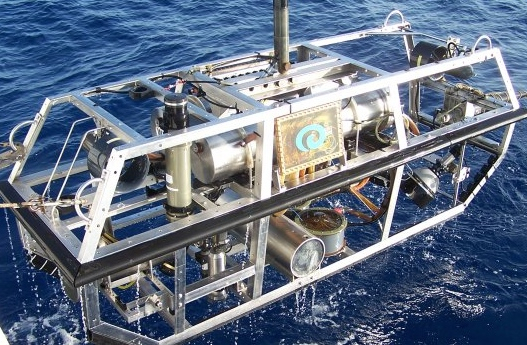 Argus absorbs the roll of the ship, steadying ROV Hercules and also provides additional cameras and lighting during the USS Macon survey. During the 2015 mission to survey the USS Macon site, the ROV Hercules will be used to map, survey and recover an artifact with its two manipulator arms. 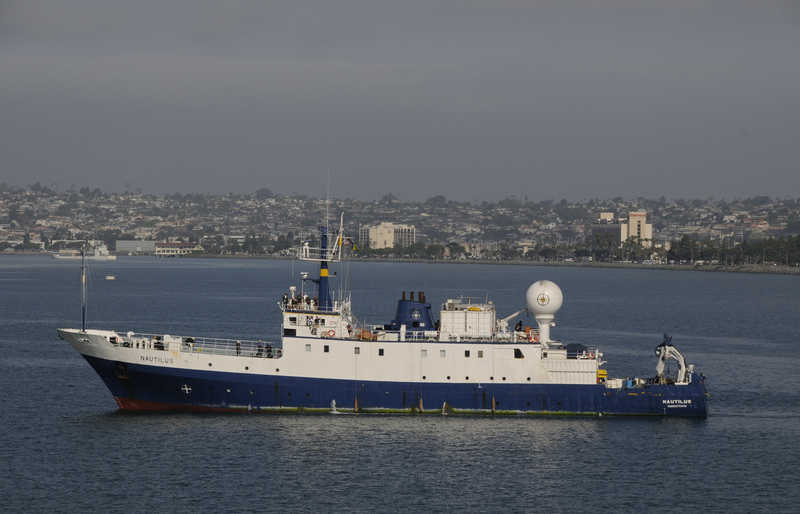 E/V Nautilus in port in San Diego during the California Borderlands Cruise. 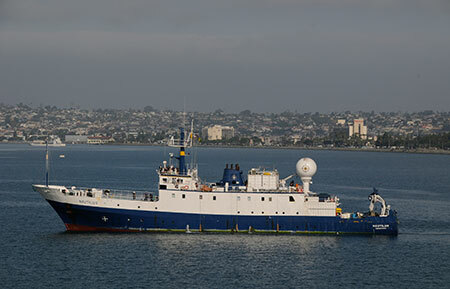 The 211-foot ship is equipped with the latest ocean technology including satellite communications, and hosts the crew and science team.